I’m halfway through my yearlong “Decluttering and Simplifying 2010” project, and I’ve made really nice progress. For the complete update on that, see last Saturday’s post. This milestone got me thinking: What have I learned so far? Here are five things I learned along the way that might benefit you. 1. Go ahead — start with the easy stuff. If you’re home is as cluttered as mine was, you can probably get out several sacks of obviously useless junk and trash pretty quickly. So go ahead. Start with things you know you don’t want anymore. Gather up the obvious bits of paper like receipts and junk mail that are messing the place up. Throw away the broken appliances and half-empty bottles of shampoos that don’t smell like you were expecting. Recycle or donate old magazines. Take a couple of loads of books to sell at your favorite used bookstore. It’s fun and motivating to get off to a good start. Besides, you need these things out of your life so you can get down to the other things. 2. Try to handle things only once, but don’t get hung up. The most efficient way to organize is to pick up an item and immediately take it to its home — either its established home or the new place you’ve cleared for it. So do that as often as you can. But don’t spend the afternoon trying to decide where something goes. Put it back down and move on, then figure out a home for it while you’re in the shower or watching TV. Or better yet, eliminate it from your life. You won’t miss it. If you can’t decide where to put something because you don’t know where you usually need it, you probably don’t need it at all. Throw it away. 3. Unless you’re desperate or have something of extreme value, don’t sell your excess stuff, donate it. Of course, if you have items with big value, find a way to get back some of your money. Try selling these few valuable items on Craigslist or take advantage of a local paper’s free ads for small, personal sales, if available. 4. Eliminate or completely clean off large, flat surfaces. Flat surfaces are made for collecting things. How many tables are in your living room? If you eat or drink in your living room, you probably want a small table near where you sit. But do you need a table of knickknacks (one of my favorite words to type) or a coffee table in the middle of the floor? If not, eliminate them. You probably can’t eliminate your kitchen countertops because they’re necessary to cover up the cabinets, but you can make them totally clean — that is, leave nothing on them other than, perhaps, a microwave and, if you must, a toaster. Bathroom counters and end tables don’t attract clutter if make sure they’re totally clean. If you pass one of these surfaces at any time and see something on it, you know immediately it needs to be moved. 5. Tell people what you’re doing. Don’t expect anyone to volunteer to come over and help, but you need to be held accountable. Blog about your decluttering journey if you like, but at least tell your friends. They’ll ask you in a few days or weeks how the project is going, and you’ll have to have something to tell them. Accountability raises your chances of success, and you want to be successful with this and all your projects, right? We’ll see what else I learn over the next six months. We might both be surprised. Horizontal surfaces are the worst. We have a pass-through from the kitchen that I am always laying stuff on. I find that usually when I am not picking stuff up it’s because I can’t figure out what to do with it. Wonderful Blog, Gip! I have followed in my mother’s footsteps and have really started packing (aka hiding) stuff in my closets and cabinets! I’m so glad you’ve suffered through this too!! Thanks for commenting again, Steve. It’s nice to have you here. Tina, I’m told my grandmother was the worst clutterer of my family. I think she kept things intentionally; most of the clutter I’ve accumulated is through laziness. Whatever the case, it’s getting better every week. I’d love to see neighborhood or complex repositories where people could leave anything they no longer want that still has usefullness. I could get rid of a lot more stuff if I knew of a place like that. then people could take anything out of there that they wanted. no money involved. Lorie, I like that idea — and the idea of libraries for all sorts of things, where you can just check out a bicyle, a lawnmower or a food processor. When I’m wanting something for one-time use, I often think that one of my neighbors probably has one they aren’t using. I really like your ‘don´t bother selling if its too much of a hassel’-idea. I´ve also experienced this when giving stuff away on Freecycle. Even though it’s nice to give away something thats of use to another person, Id rather drop the stuff off at a thriftstore, than go through and reply to numerous e-mails and textmessages. Oh, and the “clear the tables”-thing. So true.. Thanks for joining us here. I really do think selling things wastes a lot of time. Like any work, if you need the money and are willing to trade away some time to get it, that’s okay. But decluttering is important to me. Although I’ve allowed myself a year to do something that should take much less time, I don’t want to waste my time either. Great ideas! At least someone else can see the value of having a furniture top not covered with items. I like to have NOTHING sitting out on our furniture pieces and i am considered quite ‘odd’. Why have it if you don’t put stuff on it. I like clear counter tops, 1 maybe 2 items MAX in the whole kitchen. To me that is just more peaceful. Oh to have clear kitchen and bathroom surfaces. How much easier would the cleaning be?! After my hubby passed away nineteen months ago I had no choice but to downsize. I’m decluttering over forty years worth of stuff; mostly my stuff. 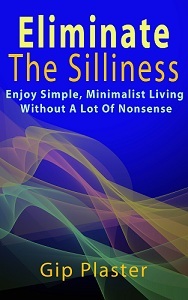 My hubby had so little, could have easily qualified as a minimalist, except we had no idea what that was. I’m in the process of downsizing again and even more has to go. I’m lovin’ my new life with less and will never go back to my pack rat ways. I’m fortunate with the selling as my daugher-in-law loves that part and does it for me. This is an excellent post—and how I agree with what you say about not bothering to try to Ebay or yard sale what you don’t want. What a hassle! I’d rather get the stuff OUT of the house, not have to worry about packaging and mailing, or tagging and displaying. I hate knick knacks too. Give me those wide open, clear spaces any day.